Alexei was born 36 years ago in St. Petersburg. The city was then called Leningrad, acclaimed as the “Venice of the North.” Alexei says that as a small child he chose musical instruments instead of the usual toys. He banged his drums not only with boyish enthusiasm but also with rhythm and style. His parents still keep the small accordion on which he played tangos. “So my parents said, ‘OK, let him study music.’ I was about 6 when I began piano lessons,” he said. In the army, Alexei was sent to the south of the Soviet Union. “All the military practices were held under freezing cold conditions, and I suffered terribly until I was fortunately treated as a musician. I was given my own room with a piano, and I arranged pieces for the military band. I also played the alto horn in the band. I had some positive experiences in the army as I learned to arrange for brass instruments. I try always to think about everything positively,” Alexei said. At the end of his two years of military service, he returned to the St. Petersburg Conservatory to study composition. “When the Soviet Union collapsed, many of my close friends left to study in Germany. I had studied German for nine years at school, and without hesitation I took entrance examinations and also went to Germany,” Alexei said. For eight years then, at the Cologne Conservatory, he studied both classical composition and jazz piano. “I wanted to master both subjects,” he said. “I thought I would bring them together.” In Germany he met Hiromi from Yokohama, whom he wooed in German. She was studying Japanese-English and Japanese-German interpretation, and proving herself very versatile in abilities. Hiromi became Alexei’s wife five years ago. 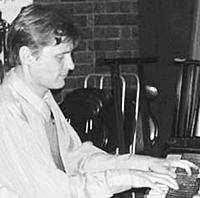 The couple left Germany for Cherepovets, where Alexei found employment as a pianist and arranger. He played for the Russian National Theater and Circus, for the Russian Folk Orchestra, and a Russian jazz, Dixieland and rock band. He said, “That marked the beginning for me of a dual career, as a concert pianist and a composer-arranger.” It also marked his skill at bridging different kinds of music. Alexei and Hiromi came to Japan in 2003. “I played in a concert, and found there were possibilities for me here,” he said. His meeting with Giichi Oya, a ragtime enthusiast, set a course for Alexei. “He provided me with much material. I began to concentrate seriously on ragtime,” he said. He now has a repertoire of about 140 tunes, which he can play with surety and panache on demand. He says he is “packed out” in his teaching schedule, and is fully booked year-round to play at concerts, festivals and clubs. “I have no time to lose,” he said. Having encouraged Hiromi to sing “rare and very entertaining ragtime songs,” he and she often perform together. Under the title “Silks and Rags,” Alexei has a CD of 18 of his beloved melodies. To each melody he gives full freshness and lightness of touch, joyous and clean. “I love all music — classical, jazz, ragtime, any mixture,” he said.